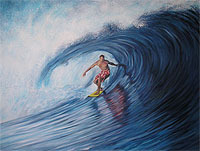 Howard Kirk grew up surfing in Huntington Beach, California. Howard and his friends traveled up and down the coast in search of the perfect wave to ride. From Santa Cruz to Baja, we would camp out on the beach and surf. My mom was an artist, but I never really tried to paint until the Spring of 2001. A friend invited me to an art store to buy some supplies and at the store I decided I would try to paint. 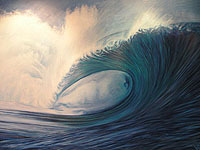 Since surfing has been such a big part of my life it seemed natural for me to paint waves, so I did. 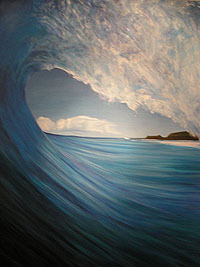 I was encouraged by my friends to paint more and so I began painting different waves and have tried to capture the beauty and power of the ocean as it collides with the shore. 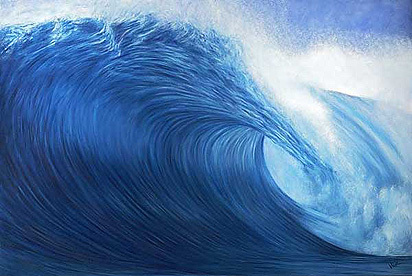 As each coastal area has a different bottom, waves take different forms as they break. Basically, as a wave travels across vast distances of the sea it is unaffected by the bottom. As it moves into more shallow water the bottom creates drag and the bottom part of the wave begins to slow. 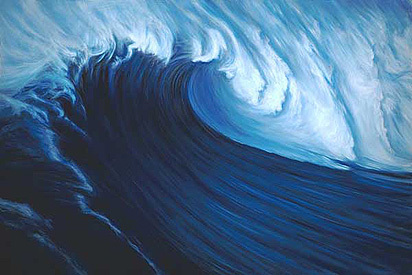 As this occurs, the top of the wave begins to overtake the bottom and the wave begins to break. 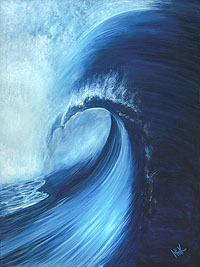 The more abrupt the depth of the water changes, the more dramatic the form of the wave. 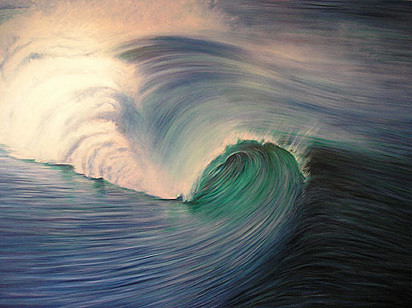 As I look to find waves with symmetry and beauty to ride, I attempt to paint waves that hopefully give the viewer a sense of the joy and awe that surfers experience. I hope you enjoy my work.